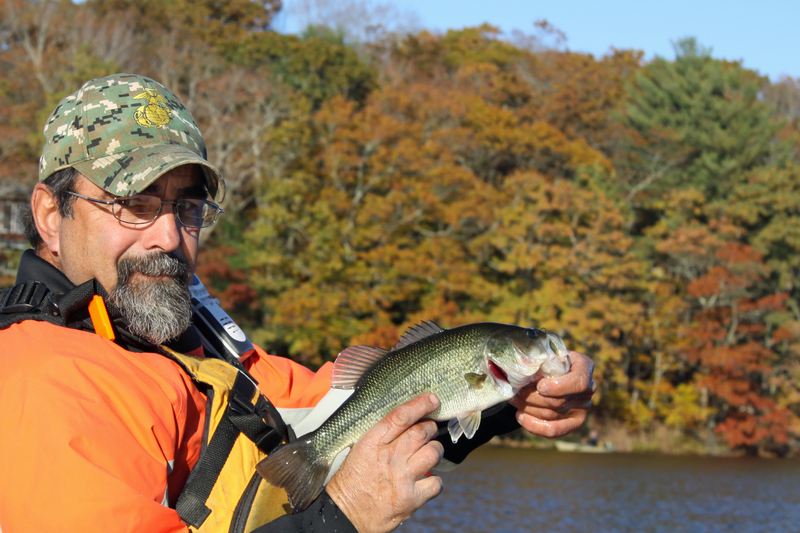 Largemouth bass are just one of several species available to angles working the late fall bonus round. Photo by Tom Schlichter. From a sweetwater perspective, November is a bonus round for Mid-Atlantic and Northeast anglers. The best of the year is already behind us but now we are playing with house money. Any day nice enough to get out is a gift and if the fish happen to bite, so much the better. Fortunately, finding a few willing combatants this time of year really isn’t that difficult as long as you know where to search. Consider largemouth bass, for example. They aren’t likely to be tight against the shore this month, nor are they wallowing in any remaining brown weed patches. Instead, expect to uncover them in relatively open water, often in small schools that give up a fish or two and then seem to dissipate only to reform should you test them again in another hour. For bigmouths, my favorite November lure is also one I break out in the spring. It’s a small, gold, in-line spinner which I cast out along channel edges, in open water where the depth is three feet or deeper, or across shallower flats if the sun has warmed the water slightly over the span of a couple days. There are other productive choices of course. Diving plugs like Rapala’s X-Rap or Husky Jerk and Yo-Zuri Pins Minnows work well in deeper bodies of water. Small jigs or creature baits worked tight to scattered, low-profile bottom structure can also be super choices some days, as can be a simple Gary Yamamoto Senko worm allowed to settle into a deep pocket not too far off the bank. Still, those in-line spinners catch well just about anywhere you toss them from the flats to the depths. Panther Martin, Blue Fox and Mepps are the standards, but it’s okay to experiment with others just to keep these brands honest. 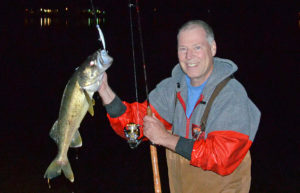 Tasty and fun to catch, walleye will continue to hit after dark well past Thanksgiving. Photo by Tom Schlichter. Walleye are another late fall option worth exploring. They feed well under cloudy skies during the day at this time of the year and persist with a night bite right through Thanksgiving if the weather stays relatively mild. Whereas the ‘eyes spend a lot of time sulking down deep in open water during the hotter months of the year, your November quarry is more likely to cruise up close to the beach making them available to waders and bank fishermen. Sometimes, they’ll even invade the same shoreline brush piles and stick-ups that bass favored back in mid-September. The thing to keep in mind when targeting walleye late in the month is that you’ll rarely have a boom night. Get down to the water, fan cast to cover an area thoroughly and then move on. You might pick two fish, maybe three, from a tight spot but the struggle of the first one you hook generally clears the immediate area. Shallow diving plugs work for the ‘eyes, as do live night crawlers on a double-hook harness drifted just above the bottom if you don’t mind culling through a ton of perch, crappies and sunfish. Carp also make good November targets. While most anglers think of these huge members of the minnow family as a spring challenge, they are easy to find and bait once the weeds die back. Look for expansive flats that are drenched by the sun between 11:00 a.m. and 3:00 p.m. and paddle, wade or cruise until you begin to push a few of these battle cruisers around. Return to areas where you had significant encounters, anchor quietly, and cast into prime territory from a generous distance away. Even better, wait until the next day and get in position an hour or two earlier than your previous encounter. Now, cast a quarter-sized bread ball, store-bought carp paste or several kernels of corn strung on a size 1 or 2 sproat-style hook and allow the bait to settle to the bottom. Given a little bit of time the carp should sniff out your offering. Set the hook as soon as your line twitches and hold on tight as 20-pounder steams away beneath a big v-wake. Serious pickerel action is also still very much in play this month. Whereas in October the biggest picks tend to hang in five- or six-foot depths off prominent points or adjacent to outflows, November sees them favor the same depths in areas that parallel straight, nondescript, boring shorelines. November is a great month to spend some quality time searching specifically for big pickerel and I make it a point to give this a shot every fall. Usually, I’ll troll 5-inch Rapalas or similar floating minnows which, depending on the lake, might also result in a nice bass or even a big trout. You aren’t likely to cross paths with many of the mean, green feeding machines if you limit your scope to working outside the shallows, but it takes just a single 3-pounder to turn most anglers into converts forever. 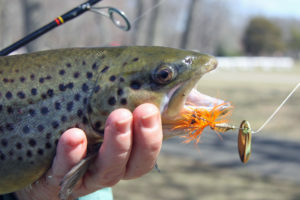 Trout can be a late fall opportunity if your area receives an October or November stocking and the season remains open. This brown fell for a Panther Martin spinner. Photo by Tom Schlichter. For all of the above, the most reliable freshwater action in November is likely to be trout fishing if you live in an area with fall stockings and an open season. You’ll find late-season trout a little more difficult to tempt with each passing week but a slow and steady retrieve with a light spinner or one-quarter-ounce Kastmaster spoon should continue to bring decent results. 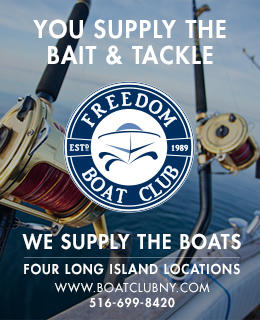 Expect catches to be best early or late in the day, and make the switch to Power Nuggets, cheese balls or a lowly night crawler as water temperatures continue to drop or any time foul weather significantly degrades water clarity.